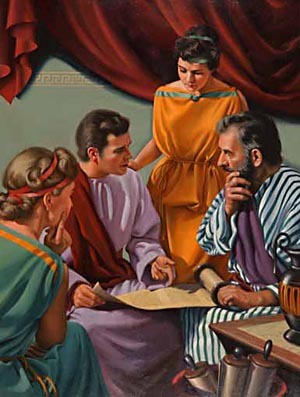 Triune God, whose very Name is holy, teach us to be faithful hearers and learners of Your Word , fervent in the Spirit as Apollos was, that we may teach it correctly against those who have been led astray into false and error and that we might follow the example of Aquila and Priscilla for the good the Church You established here and entrusted into our humble care; for You, O Father, Son, and Holy Spirit live and reign, one God, now and forever. Amen. And with missionaries and evangelists and pastors and layman, not to reveal merely the beauties of others, but to reveal the beauty of the Lord and His salvation and His way for faith to everlasting life in His Name. This day is especially good to remember to always pray for all businessmen, tradesmen, day-laborers and to pray for the Church’s mission and her missionaries in daily life that the Lord’s salvation be brought to those with ears to hear: “the poor in spirit”.